I finally found some time to update the Top 5 Chart page. This section features for each month my personal Top 5 trance & progressive records. You can check out my Top 5 Chart of October 2008 right here! 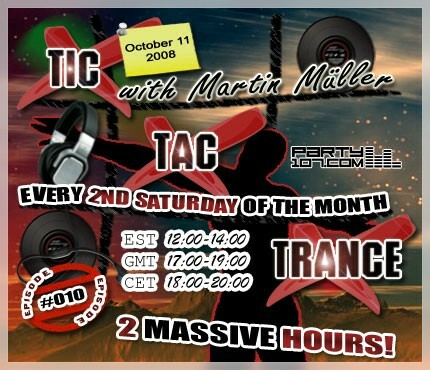 What are your favorites of Tic Tac Trance #010? It’s almost time again for another episode of Tic Tac Trance! Episode 10 will be broadcasted on October 11 2008 on Party107 and will feature a 2 hour mix from myself. Like always my set will feature the newest and lastest records and some exclusive upfront material. This two hour melodic journey will start at proggy 127 beats per minute and ends with pumping and uplifting 140 BPM tracks. Tic Tac Trance #010 on October 11 will feature tunes from artists like: Ferry Tayle, Breakfast & Mike Saint Jules, Robert Vadney (upfront album sample record! ), Dave 202, Sundriver, Redstar, Singularity, Coldplay bootleg action and some surprises! The show will start at 18 CET / 17 GMT / 12 EST on October 11. Check out your local time HERE! As you can see I’ve updated the show’s banner and logos. I think this looks now more fresher and brighter.